Alton’s Josh Rivers (right) drives the baseline on Edwardsville’s Brennan Weller on Tuesday night in a Southwestern Conference boys basketball game at Alton High in Godfrey. GODFREY – The Edwardsville Tigers came in as the worst scoring boys basketball team in the Southwestern Conference. For the opening three minutes Tuesday night, they looked like the league’s best. “We made them look pretty good, didn’t we,” Alton coach Eric Smith said. Edwardsville put Alton down by 14 points early, but the Redbirds rallied to beat the Tigers 61-49 in a SWC matchup at Alton High. The Redbirds extended their winning streak to six in a row while pushing their record to 15-8 and 4-3 in the conference. 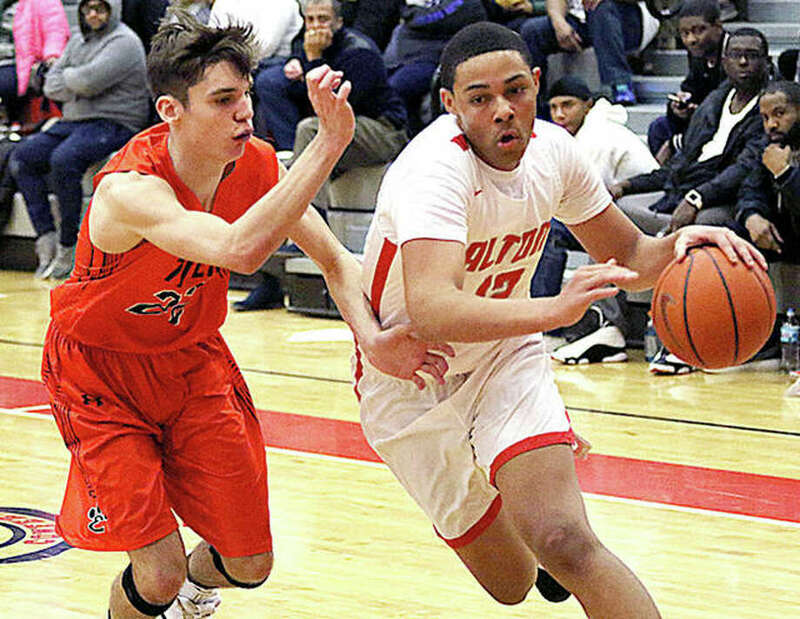 Four of Alton’s five on-court defeats – three others came by forfeit — have come against state-ranked SWC foes Belleville West (twice) and East St. Louis (twice). Edwardsville, which has been held to fewer than 40 points in a game eight times and averages 42.5 per game, was brilliant off the opening tip. A pair of 3-pointers from Brennan Weller and a trey from A.J. Robertson in between triggered a surge that left the Tigers up 17-4 after a Malik Robinson basket with 4:48 left in the quarter. Only then did a reluctant Eric Smith call a timeout to slow the Tigers, who had won five of their previous six visits to AHS. The Redbirds would do just that. Dunks from Donovan Clay and Moory Woods fired up the home crowd and helped the Redbirds get within 19-14 after one quarter. Back-to-back 3-pointers from Clay and Malik Smith opened the second quarter and Edwardsville’s lead had vanished. The Tigers were down 28-27 at the half and the Redbirds immediately attacked the rim for baskets on three early possessions in the third quarter. “That was the emphasis,” Eric Smith said of driving the lane rather than settling for 3-pointers. Alton took a 42-37 lead to the fourth quarter and the Tigers would get no closer than five points. Clay led the Redbirds with 19 points, while Woods scored 12 points and Malik Smith finished with 11. It was the fourth game in five days for the Redbirds, who impressed in victories over previously unbeaten Trinity Catholic on Friday and Chaminade on Saturady to win the Belleville East Tournament. But victories Monday over Soldan (75-71 in OT) and Tuesday over Edwardsville earned no applause for the coach. The loss drops Edwardsville’s record to 5-13 and 0-6 in the SWC. The Tigers have 10 games remaining to pick up the five victories needed to avoid their first single-digit win season since going 9-14 in coach Bud Vallino’s final year in 1988. And the 0-6 start in league play is Edwardsville’s worst since before leaving the SWC in 1979. Edwardsville could not match Alton’s firepower, but the battle of executing a game plan was a victory for the Tigers. Nic Hemken scored 15 points to lead three Tigers in double figures. Weller scored 14 points and Jaylon Tuggle finished with 11 points. And Battas continues to see progress. And Battas praised his team’s approach through adversity.